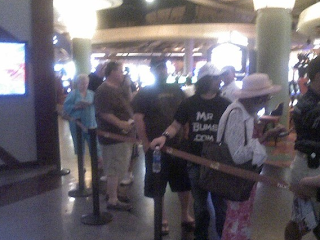 People On Line At Box Office!!! Erich and I told one another yesterday not to over-expect on the first day of ticket sales for "Las Vegas Celebrates The Music of Michael Jackson." All week, we kept telling ourselves we needed to make it to Saturday and we'd be on our way, onto the next phase of this crazy project that's only about three weeks old. That was about an hour before ticket sales began! And we're not even done yet firming up the total lineup! I mean, we added a cameo by Holly Madison this week, but these don't look like Holly fans, do they? What's also funny is that we learned earlier today that Channel 13 was sending a camera crew to the Palms to film the start of ticket sales. This actually made us nervous. We assumed most people would buy their tickets online and there wouldn't be anything for Channel 13 to see and this might prove embarrassing for us. All I can say is, Wow. This was an extremely stressful week and this response makes it all worth it. This week's LVW Col: Vegas Movie Mistakes! Dwayne “not-The-Rock” Johnson’s much-punished yellow cab burst out of the valet stand at the Planet Hollywood —which is, by the way, below ground—and, a frame later, is barreling along a street lined with parking meters that could only be Downtown. They evidently took one of those magical Vegas tunnels I can never find. And, indeed, they had. They do it just about every time. It might be Sandra Bullock and company passing the Bellagio twice heading south during a Strip drive and then passing New York-New York as if heading north in Miss Congeniality. It might be the impossibly panoramic view from the Caesars suite used in The Hangover. Or maybe it’s that part in The Mexican when James Gandolfini kidnaps Julia Roberts at the clearly marked Belz Factory Outlet Mall, which at the time was on Las Vegas Boulevard South. To escape, he cuts a right to hop on what a Town Center exit sign reveals to be the northbound Summerlin Parkway before we learn via dialogue that both characters were “heading” to Vegas. For one reason or another, Hollywood has a tremendous amount of difficulty getting Vegas right, and that has spawned a hobby among Vegas aficionados and locals of going to see movies set here with an eye for something that’s not quite right. Many of the examples cited in this piece are ones I’ve been hanging onto for a while or spent the weekend spotting in a work-related movie marathon—Fools Rush In holds up, by the way; Honeymoon in Vegas, not so much—while others are favorites provided by Facebook friends or cited on the brilliant site MovieMistakes.com. The Show is UP: Charo! You think she's just a blond, air-headed, surgically enhanced... oh, wait. That's last week's guest. This week, we've got Charo the giggly, jiggly Spanish singer and guitarist, who in the early 1970s was making as much as Sinatra for shows on the Strip, is back in town with a new headliner show at the Riviera. Steve chatted with Charo this week about plastic surgery, her affection for RuPaul and where her signature “cuchi cuchi” line came from. In banter: A weird WSOP interview story, a weird Panorama Towers ad, a weird Caesars Palace sign, a baffling Monte Carlo strategy and more. 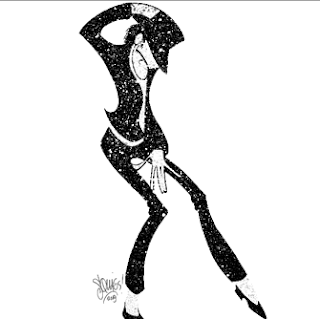 We're about to go out with our first press release on the Michael Jackson benefit concert and all I can say is that I am just exhausted. It's only been two weeks since Erich and I landed a venue, the Pearl at the Palms, and in that time the entertainment lineup has been in a great deal of flux. The show itself will undeniably wonderful and we have a number of prominent performers discussing their participation, but because of the compressed time frame and the need to get tickets on sale on Saturday, we've gone out with the lineup we have now. So much more will follow, including additional events on Aug. 29 at the Palms. Also, we changed our minds about donating the proceeds to the VH1 Save The Music Foundation largely because for some reason that charity specifically does not distribute money to Nevada public schools. Instead, all the money will be going directly to the Clark County Public Education Foundation and earmarked for specific music-education programs. Given how much the budgets have been slashed this year thanks to the recession and other state funding problems, the need is especially urgent and fits squarely in co-producer Erich Bergen's vision. Dozens of school recitals are being canceled and students in lower-income areas share instruments and can't take them home to practice. It's also great because they'll set up an account and receive the money from the box office, which pretty much allows Erich and me not to have to handle the funds. Much easier. The most telling moment was when I sat down in a friend's office last week. Me: It's [long pause] stressful. Her: Uh, yeah. You sounds surprised. Her: You didn't think this would be stressful? Me: Honestly, I really just thought it would be fun. Yeah, well. I'm often naive. But I also know we're going to put on a wonderful show and raise money for a terrific cause. More, as they say, to come. You think she's just a blond, air-headed, surgically enhanced... oh, wait. That's last week's show. This week, we've got Charo. And while many people think the same things about her, the giggly, jiggly Spanish singer and guitarist happens to also be a highly respected musician and performer who in the early 1970s was making as much as Sinatra for shows on the Strip. So, with her return to Vegas as a headliner at the Riviera, we chat her up about plastic surgery, her affection for RuPaul and where her signature “cuchi cuchi” line came from. Plus, behind the scenes of a bizarre poker interview and other news from Vegas. 1. What "tram" is there now or ever was in the parking garage at Harrah's? 2. Did the rest of the word "Caesars" fall off of the Octavius Tower or did they just think, "Aw, screw it, we can't afford the rest of the name?" 3.What is this? It's immediately north of the Rio on the north side of Twain West. Never noticed it before. 4. Is this really fair warning of a spoiler? 5. How much money did the Steve Wyrick folks spend to put these Lord of the Dance ads all over town only to kill the show even before Mike Weatherford could review it? 6. Why is the Four Seasons allowing Baumann's Rare Books at the Palazzo to showcase its wares in its lobby? 7. 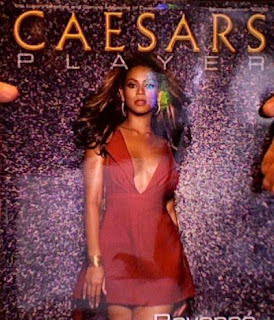 Along the same lines, why is Beyonce on the cover of the summer issue of Caesars Player, a high-end glossy magazine for Harrah's high rollers, when she's playing this month at Wynncore? 8. Do you get it? Took me a couple of seconds. 9. Should I 'Friend' this man? 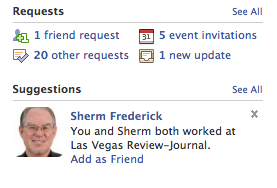 Would he Friend me back? 10. Whose hair is more frou-frou-y? "The best-paid job in all of Las Vegas"?!?! appeared in this morning's Review-Journal. (Click on it to see it bigger). I assume it's been appearing for days since the first "auditions" took place on Friday, but I've been derelict in my newspaper reading this week. The "most exciting job" claim reminds me a little bit of the big hullabaloo a few months back about where an Aussie tourism agency put out the call for "the Best Job in the World," blogging about life off the Great Barrier Reef for a time. That said, this is very, very strange. What could they possibly be hiring for? What would the folks at Panorama possibly need someone to do for which they will earn "up to $800/day" or $242,000 a year? 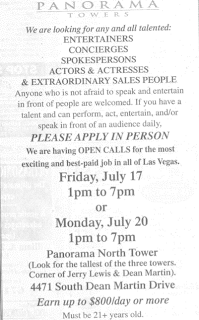 And, even at that level, the boast of this being "the best-paid job in all of Las Vegas" is blatantly untrue. Just ask, say, any of these folks. Plus, the wording here makes it sound like there is one (1) job, not that they're auditioning for a range of things. Yes, I am an investor, along with my dad and his friend, in a Panorama unit. I've not seen any traffic in board minutes but, to be honest, the thought of this sinkhole of an investment makes me so sick I rarely read the communications. But I will give them a call tomorrow and see what this is all about. In the meantime, any ideas? Anyone? On Saturday, when I had planned to hang out at the Rio taking in some World Series of Poker action, I found myself stuck in the squalid Meineke waiting area, learning that my long-term neglect of my brakes and muffler was going to cost me dearly. There was, however, a bright spot. As it happened, Saturday was the day at the World Series’ $10,000 Buy-In No-Limit Texas Hold ’Em Main Event when the “money bubble” burst—when the field was reduced to the point where everyone still in the tournament is guaranteed to receive at least $21,365. In this case, it was when the field of 6,494 players had been whittled to just 648. It’s a pretty fun moment of celebration when the 649th-place player busts out and everyone left cheers their common successes. I wasn’t there, but I had the next best thing: World Series of Poker Commissioner Jeffrey Pollack’s Twitter feed. In real time, @JeffreyPollack was blasting out 140-character-or-less updates on what was happening. It got interesting, too, as the field narrowed and then hung at 649 through 12 tense hands during which nobody was eliminated. None of the details about the game mattered so much as the suspense, that feeling that something important—to someone, anyhow—was about to happen, and that if we couldn’t be there, this was the next best thing. In the modern poker era, there have been several developments responsible for the game’s enormous growth and maturity. The film Rounders made it cool among college kids. The hole-card camera made it interesting for TV viewers. The Internet made it easy for millions to play. And everyman Chris Moneymaker’s 2003 WSOP championship made it an accessible glory for all of the above. Now, I submit, the rise of tweeting poker players will someday be viewed as another turning point. Twitter solves some important problems for the WSOP. First, it gives people who cannot attend an easy, brief and mobile way to keep up as the action is happening, important because you can usually watch every other sport on TV live during the competition, but not poker, because gambling laws prohibit that. Suddenly, the WSOP isn’t something for just the heartiest fans to follow on poker sites but an event revealing itself as we go about our days.